Did you ever feel like there was not enough time and you needed to rush between places? Well, in Iceland you can be in two places at once without ever feeling like you have to use time travel or travel faster than light. I know, that my childhood was a bit different than others. Not bad, just different. I for one, never learned how to snorkel, I was happy enough being able to swim. 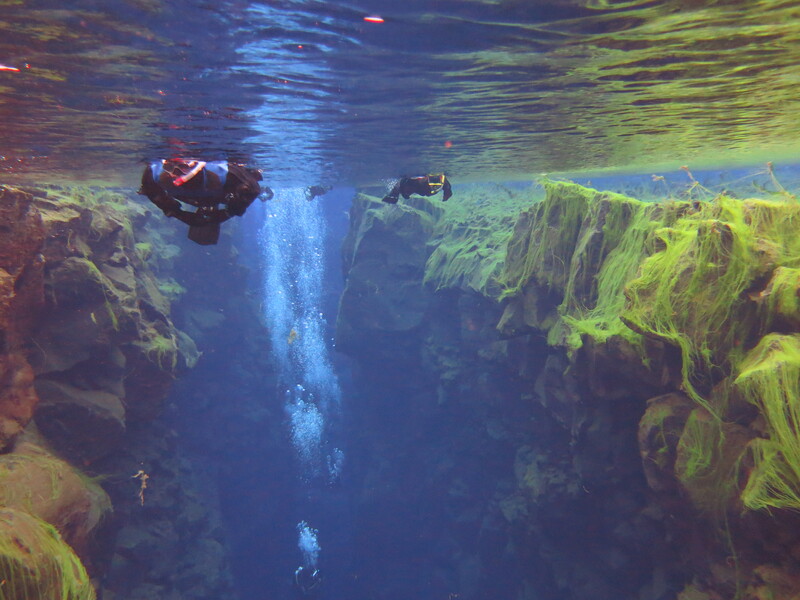 So when I found out, that you could snorkel between the European and North American tectonic plates, I was a bit apprehensive. I don’t like making a fool out of myself and knowing me, I would probably do that unintentionally anyways. But then I figured, where else or when else would you do this, if not in Iceland? The answer probably would be never and nowhere, so A and I decided to go for it. It was super foggy and rainy that day, but since we were going to be in the water anyways, it didn’t matter. Now, I don’t want you to have the wrong idea, thinking it was going to be like diving in the Great Barrier Reef in Australia, it is not. It is cold, even in the summer, and by cold I mean wool underwear cold (since we are adjusted to the Norwegian life already, no problems there!). So in our wool underwear we got put into dry suits, that make you look and feel like chocking astronauts. No, seriously. And getting them on took about 45 minutes and 14 people, getting off took about twice that time and double the amount of people. But we were committed, so there was no turning back. Prior to our stay in Iceland, I did the modern-age-thing and looked up online how to snorkel. And then I tried it in a sink full of water, not that this is comparable, but I just wanted to let you know, I was prepared! So once in the water, we were told, that we should move our hands as little as possible. When getting water into the snorkel, just to blow it out and not to worry about anything, the suit would do everything for us. Now I know, I looked like Iron man, but I didn’t know that I actually could be Iron man, turns out, in a dry suit, you can. That thing floated me without me having to lift a finger. This also means, that when ever I consciously tried to move, the suit would flip me over, manoeuvre me in every direction I could possible not want to go to. Much to my snorkeler-friends dismay, as I bumped into more than a few people and probably kicked them all at one point or another in their faces or other parts. But see, when you bite down on the snorkel and put your face down in the ice cold Glacier water, that apparently has been heated by a lava field (don’t think it’d be warm! ), it all goes away. Everything goes away. You are floating through time and space and all you hear is your own breathing. Being able to see down the divide between Europe and Northern America was simply magnificent. You have never seen such vivid colors and such clear water. It was simply amazing. Freezing cold, but amazing. And I couldn’t take my eyes off all the algae and rocks and the lifeless depth that it provides you with. (Due to the algae that apparently does not appeal to fish, the lack of this life makes it possible for us to see as far as you please). After about 45 minutes though, my fingers went numb. So I floated to the exit and took one last glance a the beauty that this part of Iceland had to offer. If you are in the area, go do this tour, you will not regret it. It is beyond anything and the picture you see? Well, it doesn’t do it any justice but the person to the right, in the back, yes, that is me. Floating around.